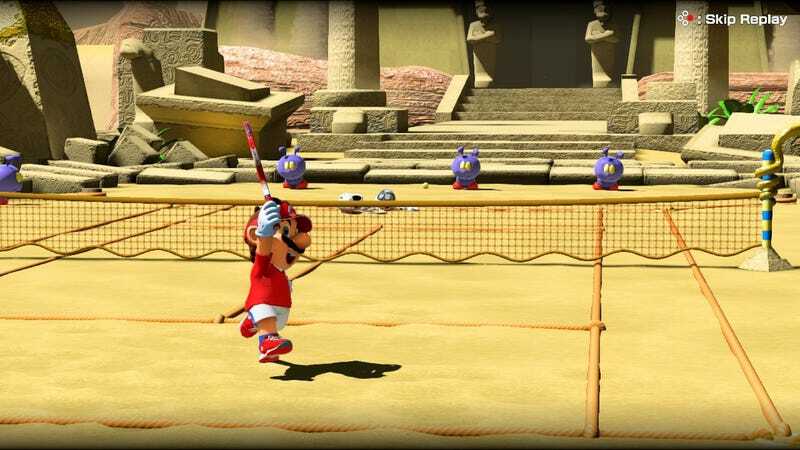 Mario Tennis Aces released yesterday, a few weeks after its online tournament demo, and I’ve started delving into its Adventure (story) mode today. That first cumulative hour also happened to be done while in the New Jersey train system. Adulthood, as I’ve experienced it, at least, is weird. On the one hand, as someone a few years beyond college who headed into a full-time job, there are way more obligations on my plate to juggle than child-aged me had. The rent and them student loans don’t pay for themselves, after all! And I’ve got no clone/body double/evil twin to do my hours of work for me, either! On the flip side, however, being an adult with a good deal of autonomy has also proven to be liberating in ways I’m still learning to appreciate. Having a hankering for brownies? I can drive to the grocery store, buy some mix and other ingredients if needed, and bake them myself at home, with no outside approval necessary! Are there concerts with cool musicians that I want to attend? My time, my money, and my car are mine; I’ve got all the power to make it happen! And it also means that on a Saturday after a week of work, I could participate in a brunch in Hoboken with a several of my coworkers consisting of fifteen percent eggs benedict but mostly copious amounts of mimosas and bellinis. I am the master of my own fate. Getting there, and then getting back back, however, required an hour-plus of train time each way. How to pass the time? My answer today was to invoke the Nintendo Switch, along with a fresh copy of Mario Tennis Aces. It wasn’t the most ideal set of circumstances—it’s marginally harder playing handheld mode on a moving vehicle than the same thing on a stationary couch, especially when gyroscopic aiming comes into play, and the Adventure mode thus far is entertaining but also decidedly not online PvP—but it did the trick! Much of that train time melted away, absorbed in cursing the piranha plants on my little screen. Before this year, I had only played three Mario Tennis games. First, the Nintendo 64 original, which I wholeheartedly loved. Next, Ultra Smash for the Wii U, which looked great but seemed like a heavily railroaded gameplay experience. Crucially, neither one was any of the Mario Tennis installments released on Nintendo’s handheld systems. Thus, being able to play one of these games while mobile, even being able to brave public transportation in the meantime, is a whole new ballgame for me. Yes, it was the same as when it happened with Mario Kart 8, and also with Splatoon, and also with Super Mario Odyssey. No, it still has not gotten old even yet. May it never get old.